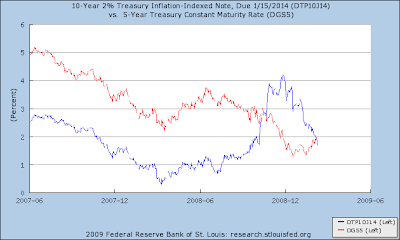 Here (in blue) is the yield on an inflation-adjusted bond and (in red) the yield on a nominal bond of approximately the same time-to-maturity. The negative inflation compensation that showed up a few months ago (when the blue line was well above the red) has shrunk to about zero. These relative yields are moving back toward a more normal, and healthier, alignment.